It is statistically likely that highly creative people have at least 15 projects laying about in various states of incompletion. (I heard it explained once that creative people don’t have clutter, it’s just great ideas lying about.) I’m certainly guilty of that situation, and now and then I get the itch to pick up a languishing project and make a point to finish it. There’s a real glow when starting off on a new project, and sometimes the grind that ensues after the rush of vision and setup gets sidelined by the enthusiasm of the next new piece. But tapestry is incredibly patient, waiting without complaint until I return. Part of the sidelining of this particular piece was the sheer volume of focused energy required to complete the unicorn tapestry “Deceiving the Hunters,” which left little room for working on the other tapestries in my studio. But now it was time to pick up this little gem and figure out where I had left off. Weaving on a round loom comes from the Navajo tradition and a technique I was eager to learn from mentor Fran Potter. 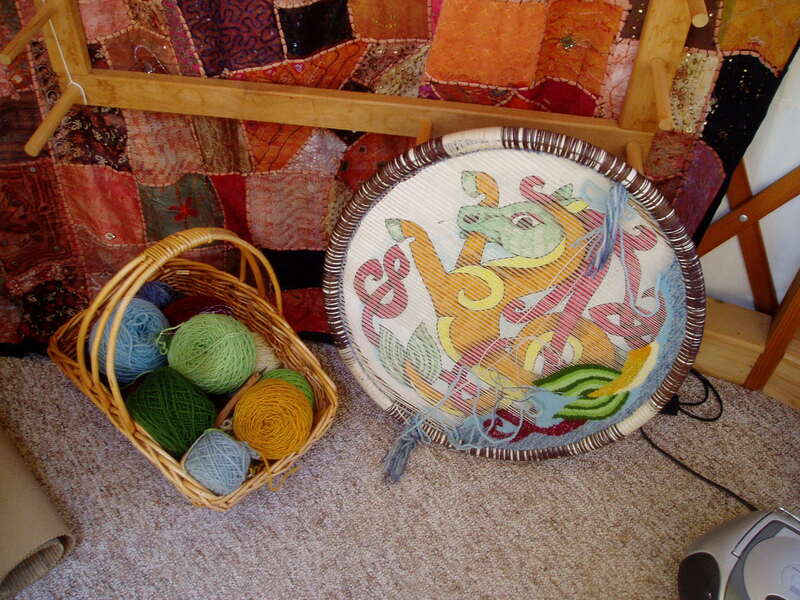 In order to weave a round tapestry, a strong round frame must be found–in my case, the metal base of a swivel chair. After removing the cross-bars, giving it a good sanding and paint job, the next step was to create the warping board. Tracing along the inside of the loom frame onto a sturdy board, I then drew out the warp spacing. At each intersection of warp with frame circumference, that’s where a small nail was pounded into the board. Zig-zagging the warp across the nails created the right shape and spacing, twining was added around the edge, and followed by lashing the twining and warp onto the frame all the way around with wax linen (a tedious process that’s pretty rough on the hands and fingers). Then carefully, oh-so-carefully, the loom is lifted off of the warping board and is now ready for weaving. I’ve made several round loom pieces, which are charming not only for their very unique shape but also for the extreme portability of the loom itself! I’ve even woven on mine while sitting in the passenger’s seat with the loom propped between my lap and the dash board. For the cartoons, I hand draw them on paper that I then attach to cardboard to hold up behind the piece for reference, rather than lash the cartoon to the back of the tapestry. This is due partly because this style of tapestry requires weaving from both ends and meeting somewhere in the middle-ish for finishing. For this particular cartoon, I was playing with variations on a traditional Celtic zoomorphic seahorse with knotted mane. 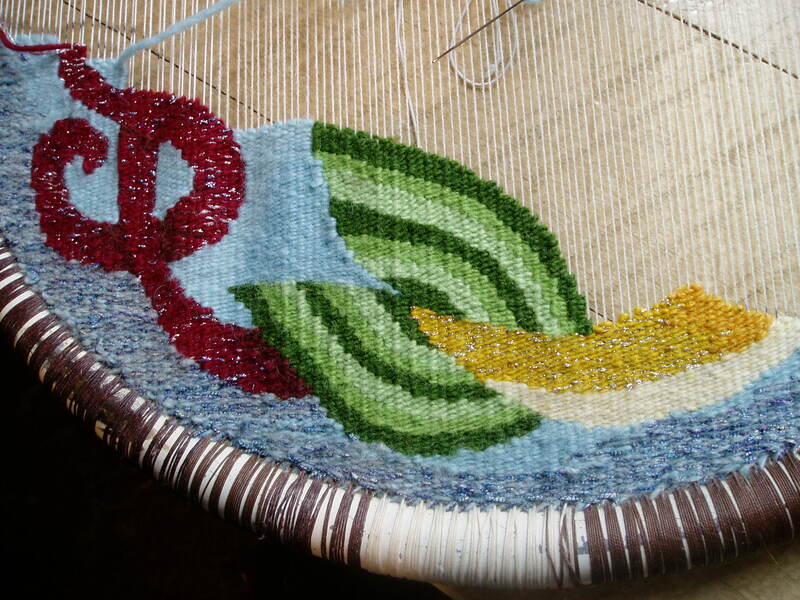 I had previously started the fishy tail and a little of the knotwork–enough to get a sense of the coloration I had in mind. Along with using traditional lopi wool, I was also blending in novelty fibers for texture and sheen. I wanted to get a sense of the sparkle of the watery world, of scales. No shiny novelty fibers are used in the “shadows” where knotted parts weave behind each other, adding to the sense of depth that will become more apparent as the piece grows. Because the space is so tight in a round loom and there are no “sides” to the tapestry, the stick shed has been reduced to a strand of round elastic, and the pull shed has been abandoned. I pick up each warp thread with the weft on a tapestry needle, one at a time, which makes the process feel almost like a tapestry version of embroidery. But oh the fun when I get to take off all that waxed linen and the piece stands on its own, round and beautiful. More progress notes to come!